Suicides in which multiple gunshot wounds are present are uncommon, but not rare. These wounds may involve only one area, e.g., the head, or multiple areas, such as the head and chest. Multiple gunshot wounds confined exclusively to the head are the least common, whereas those of the chest are the most common. A lack of knowledge of anatomy, flinching at the time the trigger is pulled, defective ammunition, ammunition of the wrong caliber, or just missing a vital organ, account for such multiple wounds. 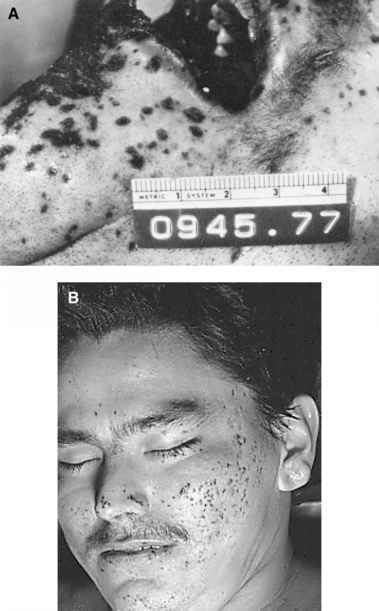 Occasionally, individuals have shot themselves simultaneously in the head with two different weapons (Figure 14.10). 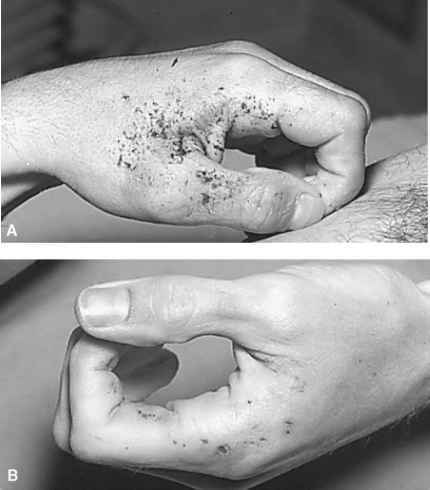 Wounds that may appear to be fatal on initial examination may not be so on autopsy. Thus, in an individual who shot himself four times in the chest and once in the head with a .22-caliber pistol, one would assume that the head wound was the fatal shot. However, the autopsy revealed that the bullet flattened out against the frontal bone, and death was due to one of the four gunshot wounds of the chest, with one bullet going through the heart. The largest number of gunshot wounds in a suicide that the author is aware of is nine.5 The weapon was a nine-shot .22-caliber revolver. All nine bullets entered the chest, with one perforating a vital organ, the left lung, causing massive hemorrhage, hemothorax, and death. wound with potentially lethal levels of drugs. Apparently the drugs do not work fast enough and the individual decides to shoot himself. Another individual shot herself twice in the chest with a .22 rifle. Only one bullet entered the chest cavity piercing the left lung, producing internal hemorrhage. This apparently was not quick enough as the woman, then cut her wrists with a broken bottle. Another individual, wishing to make absolutely sure he would die, placed a noose around his neck, tied one end to a support, and then shot himself in the head. The bullet itself would have been fatal, but as he collapsed, he suspended himself by the neck. If he had survived any length of time from the gunshot wound, he would have died of hanging. 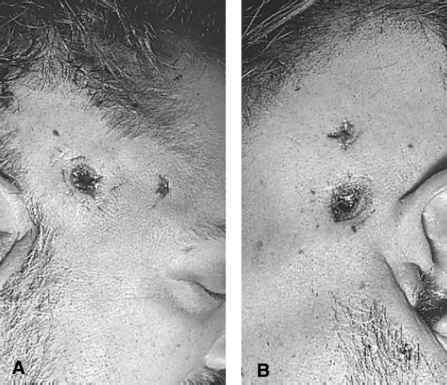 Figure 14.10 Simultaneously inflicted perforating gunshot wounds of head from two .25 ACP automatic pistols. Entrances of right (A) and left (B) temples with muzzle imprints and exits of bullets from other side. The most unusual case of this kind the author has seen was a young woman who shot herself in the chest with a revolver while standing at the end of a pier. She was seen to collapse immediately after the discharge of the weapon, with the gun falling onto the pier, and the woman tumbling backward into the harbor. The body was recovered a few hours later. At autopsy, she was found to have a through-and-through gunshot wound of the left breast. The bullet did not enter the chest cavity and did not injure any major blood vessel. The cause of death was drowning. Most people who shoot themselves do so in private. Exceptions are numerous, however. Individuals have shot themselves in front of friends, spouses, relatives, and even crowds. The place chosen for the suicide may be quite bizarre. Individuals have shot themselves while driving, in police cars, and on television. One individual climbed into the trunk of his car, closed it, and then shot himself with a shotgun. Sometimes the fatal bullet will exit the victim and either re-enter another area of the body or strike another individual. In one case, an individual shot himself in the head while holding his other arm across his head, almost as if covering his ear. The bullet entered one temple, exited the other, and then lodged in the upraised arm. Another individual shot himself while lying in bed with the bullet exiting and striking his wife. Suicide is not acceptable in American society, and thus there is often strenuous objection to the ruling of a death as suicide. The objections can vary from the naive "he wouldn't do such a thing" to a sophisticated and complicated explanation for why a weapon "accidentally" discharged. These objections can be motivated by guilt, religious belief, social pressure, or avarice. Individuals may contest the ruling of suicide by stating that the deceased, though previously depressed, had recently been happy. In fact, it is not uncommon for individuals who have decided to commit suicide to show an elevation in mood before the suicide. After all, they have solved their prob-lems—they are going to kill themselves.